Does my chimney need flue Lining? We are asked this this so often. The answer is yes and no. Confused? Then please read on. When we install any new stove we always fit a new liner as well as the Wood burning Stove. There are many reasons for this besides the carbon monoxide aspect. However it is not strictly a legal requirement. If an installer is confident that the chimney is sound and furthermore does not leak then you don’t have to have one. Despite this statement, it’s difficult to be sure 100%. Flue lining is a great way to be 100%. A smoke test needs to be carried out and is called Smoke Test 1. This involves sealing the chimney pot. Up to the roof we go. We use a plastic bag and bands. Besides this, the Fireplace opening also needs sealing off. Backer boards are taped together. Furthermore we then make a little trap door in the front. We only need enough room to light a smoke pellet. When everything is sealed we light the pellet. All areas now need checking for smoke. If any smoke escapes into the house however, the smoke test will fail. This indicates a integrity fault in the chimney. In other words a leak. We inspect all floors, including the loft or attic. If it’s a semi detached house or terrace, next door will have to be checked as well. You can already see how flue lining makes sense. OK so that’s the inside inspected. However the exterior will need to be inspected as well. We check the eves and chimney stack also. If there are any leaks whatsoever, it’s a fail! Moreover if a chimney leaks, smoke could be entering the property. Besides which, it could be letting carbon monoxide into your home. As you can see from our description of smoke test 1. There is a lot of time in performing this task. Its also a two man task. Because of this and other reasons, Glowing Stoves always recommend fitting a liner. Chimney liners improve wood burning stove efficiency. Flue lining improves the airflow within the chimney. Its recommended to fit a flue liner as near to the stove outlet size as possible. Never fit a liner smaller than the outlet. It is against Hetas regulations and will be condemned. A Flue Liner insulates the chimney. When a chimney is lined with a flue liner a barrier is created between the flue liner and chimney walls. This helps insulate the chimney from corrosion and heat. 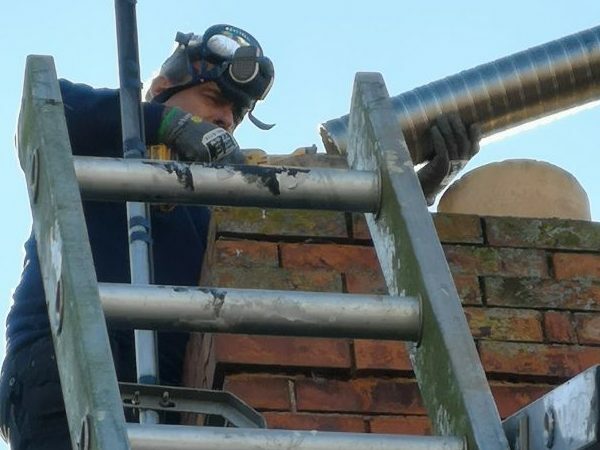 Flue lining reduces the risk of a chimney fire. Chimney heat is very much reduced when a flue liner is used . This in turn will reduce the chance of a chimney fire. A chimney with a flue liner fitted helps prevent damage. Gases generate condensation especially at low temperature. Furthermore it is this cycle of condensation that is damaging for your chimney. This is prevented if your chimney has a flue liner. Flue lining reduces the build up of Tar, Creosote and Soot. Condensation from woodburners contribute to Soot, Tar and Creosote accumulation. Moreover, because these are combustible, chimney fire risks are reduced. Besides this, it also makes it easier to sweep. Glowing Stoves do flue lining throughout Somerset and Devon. We supply and fit 316 grade flue liners and 904 grade stainless steel flue liners. We have found that the really cheap liners found on eBay and the likes, don’t last long. More info can be found on the Hetas website. Contact us for a flue lining quotation.